← OmniFocus 2 and OmniOutliner 4 on their way … at last! Despite alternatives to Microsoft Word it is not possible to completely avoid using it in academic work on a Mac. If you have to edit texts in MS Word you might as well do it smoothly and efficiently, save time and preserve focus by replacing mouse movements with keyboard shortcuts. Unfortunately, keyboard shortcuts in Word on Mac are significantly different from those in other Mac apps and in Word for Windows. Some of those are listed by Microsoft, but many of my favorite commands are not in this list. Fortunately, there is a way to define keyboard shortcuts for most frequent tasks. One way to do it is through System Preferences. The Keyboard Shortcuts tab in the Keyboard preference pane allows you to define shortcuts for performing menu commands from specific apps, including MS Word (see example in the screenshot below). Unfortunately, this method has not been working perfectly for me because (a) one needs to type menu commands exactly as they appear in MS Word, even a smallest typo will lead to malfunction and (b) some of the things I want shortcuts for are not menu commands. For example, I often want to change the style of a particular paragraph to one of the standard styles such as Title or Footnote Text. 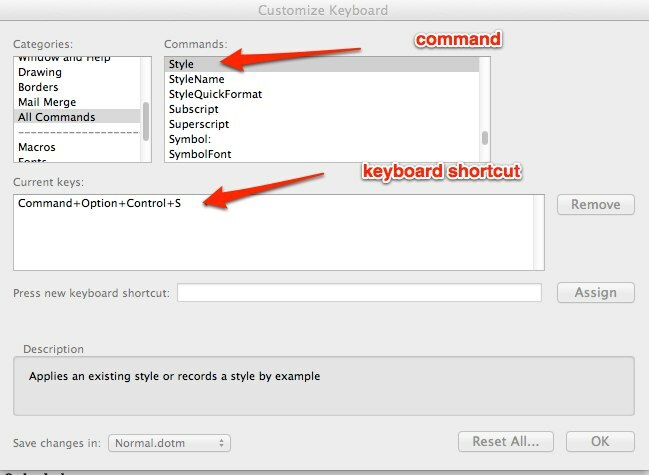 The default word template does not have keyboard shortcuts for such styles (although it does for more frequently used Normal and Heading 1-3). Normally I would take my mouse, go to the style selection window and scroll through dozens of styles to find the one I need. For years, I really missed an MS Word for Windows shortcut ^⌥S which would bring my cursor directly to the style selection window and let me just type the name of the style I need. And I had no idea how to do it through System Preferences, because it’s not really a menu command. ^⌘Space – clear formatting (i.e. return to default style formatting). This entry was posted in Automation, Writing and tagged Microsoft Word, OS. Bookmark the permalink.